Bill Ochs with Irish Arts Center founder Brian Heron. In the razzle-dazzle atmosphere surrounding the Irish Arts Center in Manhattan these days with their seemingly non-stop programming and the building excitement about their new Clinton headquarters, it doesn’t do any harm to look back on its more humble beginnings that helped establish a foundation. We were reminded of that in a recent interview with Bill Ochs, one of the first music teachers for the fledgling Irish cultural center known as An Claidheamh Soluis founded by Brian Heron in 1972. Some 40 years later, Ochs still resides and teaches in the Hell’s Kitchen neighborhood after a chance encounter in Greenwich Village that first year with Heron, who was looking to start up an educational component to his innovative movement. And in those four decades he has amassed a sizeable collection of music history published in books, manuscripts and recordings, along with a reputation as one of the more knowledgeable Irish music teachers in New York who have contributed a great deal to its development in the Big Apple. Like so many people in the era of the folk music revival, the music of the Clancy Brothers appealed to him and he would play along with the songs on a tin whistle he newly acquired from a friend. It was the start of a long, interesting career for the young man of the Jewish faith from Essex County, New Jersey who had a penchant and academic interest in theater arts. Not long after he attended a concert by folk singer Pat Sky, now known as one of the better American-born uilleann pipers who happened to have a solo opening act named Liam O’Flynn. O’Flynn was in full flower as one of Ireland’s piping masters, sparking a revival and interest in Ireland’s native instrument and soon to be deified as a founder member of the super group Planxty. Ochs was mesmerized by O’Flynn’s mastery of the pipes and wanted to learn to play them. He sought out one of the only people teaching in the greater New York area, Tom Standeven in South Jersey closer to Philadelphia. Like Ochs, Standeven had no Irish heritage to fall back on, but they shared a determination to acquire as much information and experience and expertise as they could. Ochs went to Ireland to get closer to the source, and with letters of introduction from Standeven he easily found willing tutors of the pipes in Ireland like Seamus Ennis and Willie Clancy, where an eager American student made an impression on the older players who often faced indifference in their own localities to traditional Irish music even into the 1970s. Ochs made early contact with Pat Mitchell of Na Piobairi Uilleann who took him under his wing. Ochs would return the favor for NPU down through the years serving as a teacher and lecturer at various tionols. In the summer of 1972 he was fortunate to spend time with Clancy in Miltown Malbay, Co. Clare because the legendary piper died at an early age in January of 1973. 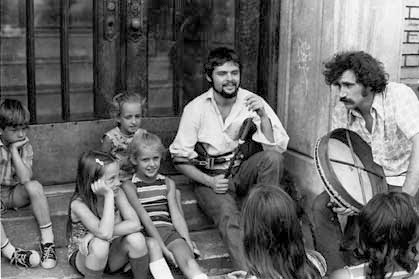 Ochs’ own progress on the pipes was both recognized and advanced by a grant by the National Endowment for the Arts to study in Ireland for six months in 1976 which led to touring with one of Mick Moloney’s early tours of the U.S.
Ochs mixed some entrepreneurship with his educational goals when he arranged to create an instructional book to go along with the Clarke C Tin Whistle manufactured in England, and to date the Clarke Tin Whistle tutor collection has over 250,000 in print. That provided him with some funding to follow through on one of his other objectives in filming the iconic North Clare musician Micho Russell whom he met in earlier years in Clare and also at the Smithsonian bicentennial celebration in 1976. The resulting video titled "Ireland’s Whistling Ambassador" captured the tall, shy, yet roguish, musician in all his colorful glory on the whistle, flute, song and stories that made him one of the folk heroes of the Pure Drop until his untimely death in February, 1994. On Sunday, November 10 from 2-5 p.m. at the Irish Arts Center (553 West 51st Street) Ochs will lead a special master workshop called "Beyond Jigs and Reels" for all instruments at intermediate and advanced level. Drawing from his extensive personal collections featuring written music from over 300 years and 100 years of recorded material, the focus will be on teaching of seldom heard music in the Irish canon at music sessions. Students can learn planxties, highlands, mazurkas, barn dances, clan marches and harp tunes to enhance their own repertoire. For reservations call Ovationtix at 866-811-4111, and for questions call Ochs at 212-247-3231 or visit www.pennywhistlepress.com. Ochs also is available for private lessons via Skype.